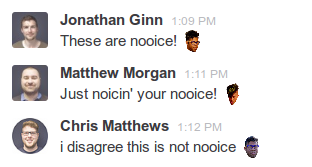 At Base we say 'Nooice' a lot, from Key and Peele's sketch. 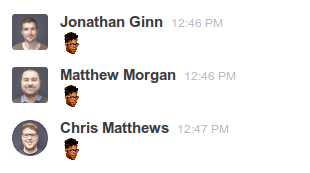 We also use Slack with a lot of custom emoticons. It was high time we had a NOOOICE emoticon. So I made one. Just add it to Slack in your team settings. But what if you want to NOOICE! someone's NOOICE? Well, I made an emoticon for that too. But what about those rare occasions something is... not nooice? Don't worry, I've got you covered.